Los Alamos National Laboratory and Northern New Mexico College announce a collaborative effort to expand a pipeline training program for radiological control technicians who will support the 21st century workforce at the Laboratory. 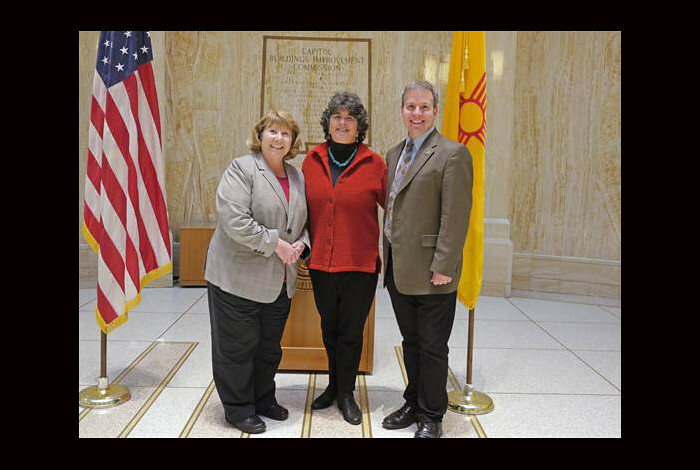 From left: Nan Sauer, director of LANL’s Pipeline and Partnerships Office; Kate O’Neill, New Mexico Secretary of Higher Education; and Rick Bailey, Northern New Mexico College President. LOS ALAMOS, N.M., March 19, 2019—To meet the high demand for radiological control technicians (RCTs), Los Alamos National Laboratory and Northern New Mexico College (NNMC) will begin offering a newly expanded associate degree program in Radiation Protection for an initial cohort of 40 area students this June. The degree is a gateway to well-paying jobs in key mission areas at Los Alamos. RCTs play a vital role in all Laboratory activities above a certain hazard level, where they must be present to actively monitor contamination levels, verify dose rates for areas and people, ensure compliance with federal and Laboratory policies and procedures, and complete the associated documentation. “The Laboratory needs trained radiological control technicians so we can carry out our crucial operations safely, and we see a strong demand for these positions into the future,” said Thom Mason, the Laboratory’s director. “We’re very excited to collaborate with Northern New Mexico College in Española to build an education program to prepare area residents to do this work. The curriculum will follow Los Alamos and U.S. Department of Energy training requirements for RCTs, with the Laboratory providing technical staff to take part in instruction. The Laboratory, which is funding the program, will offer internships to students to work at the Laboratory while they are pursuing the two-year program. The five-year agreement follows a successful pilot program, which has already seen students trained at NNMC take positions at Los Alamos. Northern New Mexico College (NNMC) is a minority-serving institution, offering bachelor's, associate, and certificate programs. The college primarily serves rural communities within a 40-mile radius of its campus in Española, New Mexico, within one of the most underserved regions in the state. NNMC is also the proud recipient of the 2019 Organization of the Year award from the Greater Española Valley Chamber of Commerce and the 2019 New Mexico STEMY award winner as the Science, Technology, Engineering and Mathematics Higher Education Institution of the Year. NNMC also maintains the most affordable tuition and fees of any four-year college in the Southwestern U.S., the third lowest average student debt upon graduation of any four-year college in the country, and the top performing High School Equivalency program in the nation for the second year in a row.